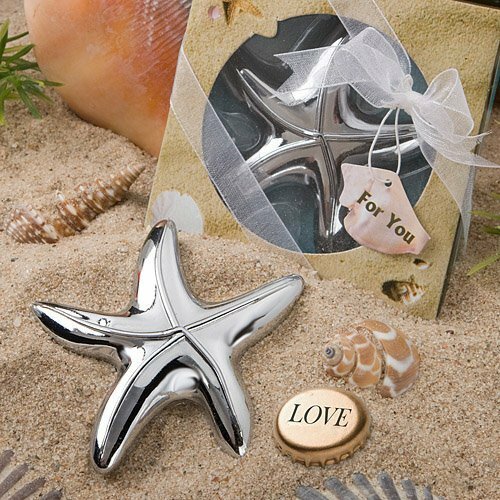 Whether you're celebrating oceanside or just want to give your event some beachfront flair, these clever starfish bottle opener favors are certainly a great catch! Each silver metal bottle opener measures 3" by 3" and is shaped like a 5 pointed starfish. Arrives in a beach-themed gift box with display window, organza ribbon and shell themed "For You" tag. I'm sorry for the confusion. There was a mistake on the pricing for 16 - 33 Favors and 34 - 95 Favors. Our Technical Team will change the price today and the price of 50 favors should be 1.59 each. I'm sorry, we do not offer engraving for any of our favors. It may be possible that they could be engraved by an outside source, but we can't speak to that since we don't offer that service. I'd recommend buying 1 sample on our site to be sure it will suit your needs before placing a larger order.